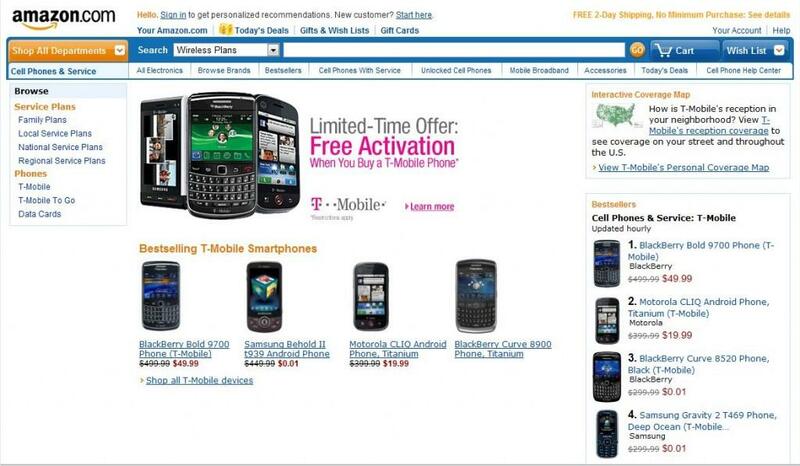 AmazonWireless, the Amazon.com wireless store, announced that it has expanded its T-Mobile rebate-free, free two day shipping phone offerings. Coupled with the new devices, the addition of new plans and along with contract extensions is the capacity to establish new service and keep your old telephone number! What the hell took them this long? Amazon is promoting this new service with a waived activation fee now through March 14th. The phone additions include BlackBerry Bold 9700 and Curve 8520; Motorola CLIQ; Samsung t749 Highlight, Behold II, and Gravity 2; HTC TouchPro2; Sony Ericsson Equinox; and the T-Mobile 3G Dash. To heck with this! Tmobile, work with Motorola to get the Motoroi!!!!!!!!! Not this crap. So I did a mock signup and I’m still being charged an activation fee. What gives? Sorry, I meant to post my rant on the Moto Crap XT post. My wife decided she had to have a keyboard (tried to steer her to the HD2) and wanted Win Mobile for easy sync with here work stuff. So she just purchased an Touch Pro 2 from Amazon. We went to the local T-Mo store and they wanted $270 with 2 year contract. Plus I would guess there would be taxes on that. So she paid $225 and there was the waived activation fee. wonder if Amazon will have the HD2?